In the middle of Navratras and the week and on a day when India had just lost a semi-final game in the cricket World Cup, I expected people to be home. My expectation proved to be true as I entered Zaffran with my family to find it completely empty, and it remained that way till we left. Don’t worry, you’ve not missed out anything, this is just one of those previously written reviews I keep finding hidden in files on the computer. We, as a family, are early eaters, but I can imagine Zaffran to having work hard in order to attract a crowd as it’s based in a Mall that doesn’t generally attract the common public. I too would have skipped it had Zomato not sent me a Rs 500,- discount coupon for the place. 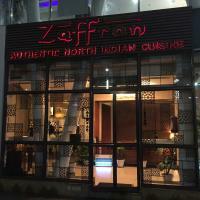 I must say that Zaffran would probably do much better business (in case it does not) only if it was situated in a more central location. However, this quaint, medium sized property with aesthetically decorated interiors, a glass kitchen, and an overall semi-casual look had a charm of its own, something that might be lost were it filled up to the maximum. At Zaffran for a small dinner with the family, since not all were eating, there was a lingering smell in the air (maybe the place had been refurbished recently or because it was empty), but overall it proved to be a nice experience. The staff was courteous and I guess since we were the only ones there, we got their full attention. 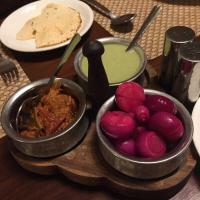 The starters comprised of the age old favourites Paneer Tikka and Dahi Kababs. While the Paneer was perfect (off late many restaurants end up charring the paneer in a tikka) the Dahi Kabab wasn’t the best looking one I’ve had, but it tasted just fine. There are now so many variations to the Dahi Kababs that are being served in various restaurants that I no longer know which is an authentic one and thus never expect anything special because there’s no telling if it will be soft, semi-soft, or hard in texture. In the end it is always about taste and as long as that is satisfying, I’m happy with it. The Watermelon Mojito, though refreshing, was a slight disappointment. It was stated in the menu that they use watermelon syrup, so that was not an issue, rather the sugar added was in the form of granules which had not been crushed properly making the drink “crunchy” and not as welcoming as it should have been. For mains we tried Zaffran’s Dal Makhni and Kashmiri Dum Aaloo with an assortment of breads (Naan, Pudina Parantha, and Romali Roti). The Dal and Dum Aaloo were well cooked. 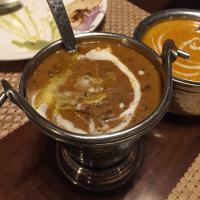 The gravy for the Dum Aaloo was semi-thick and spiced beautifully giving it a rich Kashmiri taste. Both the mains were not at all spicy, just the way we like it. The breads were all adequate. The quantity too was enough for 4-5 adults to eat comfortably. Unfortunately, I was unable to try more from their menu during this visit. 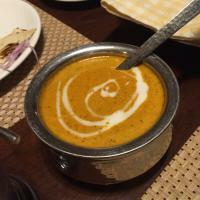 From what I ate, Zaffran seems to be a little hidden gem in the cut-throat world of the culinary business. 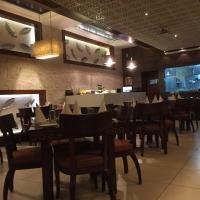 Another attracting aspect of the restaurant is that it is moderately priced. The entire meal which included a couple more non-alcoholic drinks was for roughly Rs. 2000 (excluding the discount). It might be a little out of the way for many, but Zaffran is worth the detour if you are looking for fairly good North Indian food. That looks like a hidden gem that ought to be discovered by many more. I hope you get to go back and try more dishes from their menu. Thanks and finally glad to know someone got it.